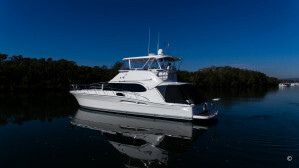 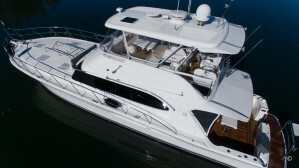 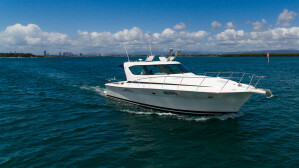 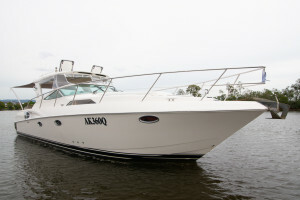 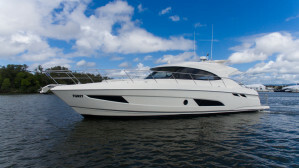 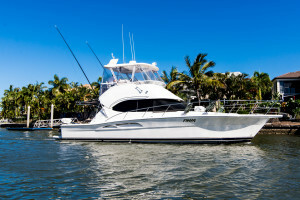 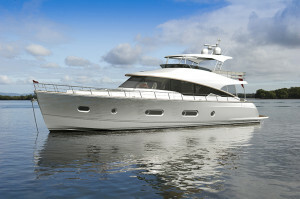 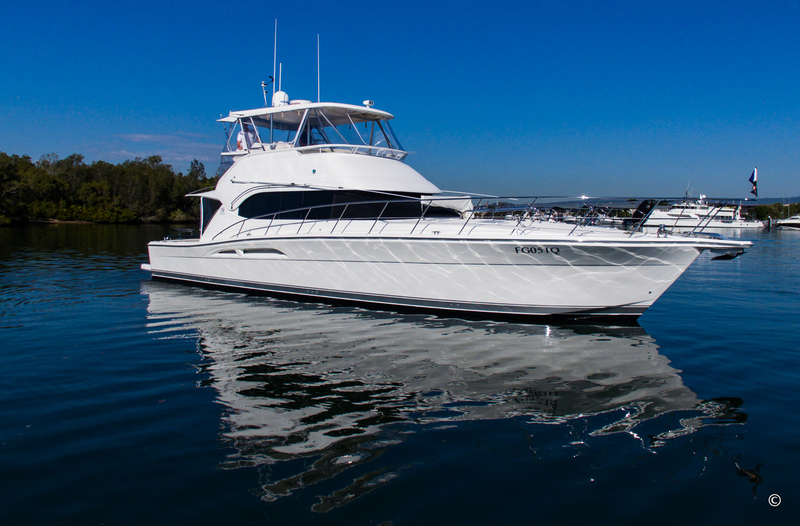 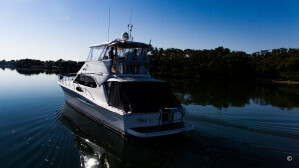 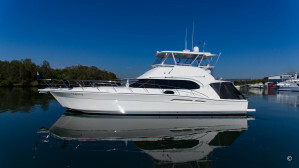 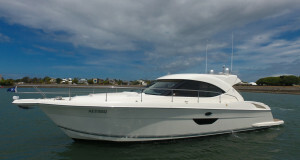 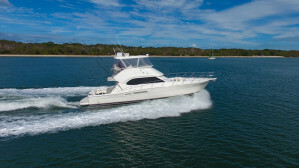 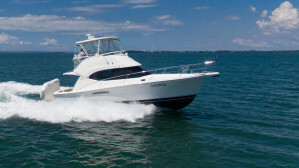 RIVIERA 51 Flybridge 2007 model powered by twin CAT C12's with 715hp. 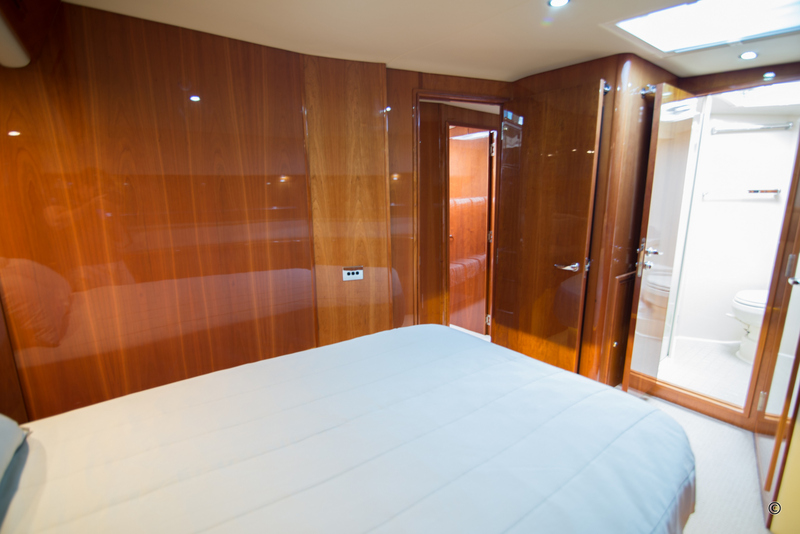 Just antifouled and detailed ready for delivery with nothing to spend. 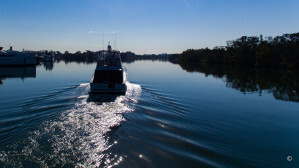 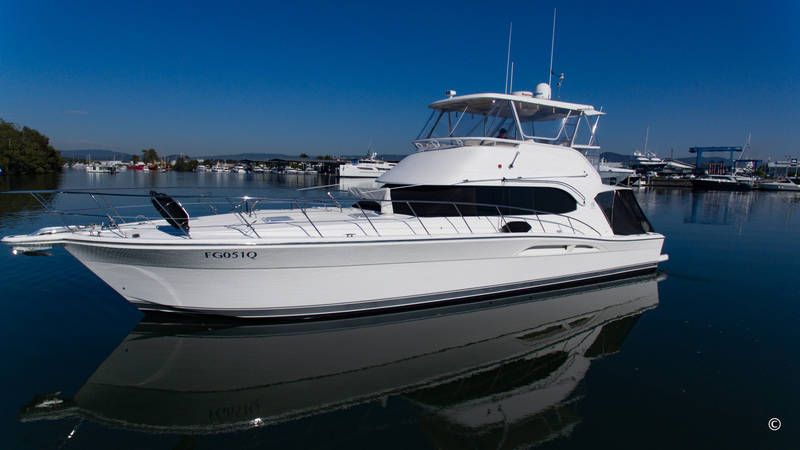 The CAT C12's and the underwater exhaust combination creates smooth, quiet and efficient cruising at any speed. 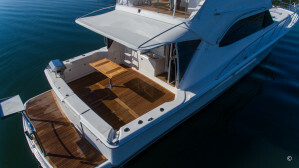 See below some of the many features and added extras. 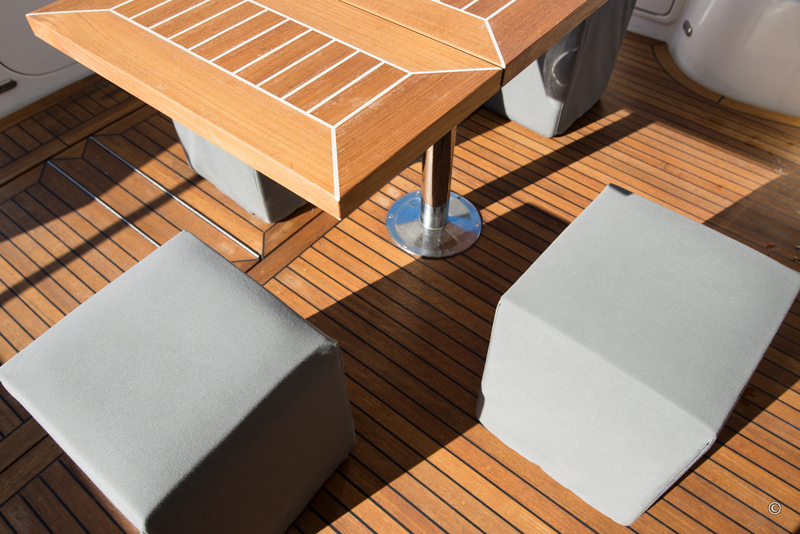 Teak cockpit fold-out table with 4x ottomans to make a comfortable seating for up to 6 people. 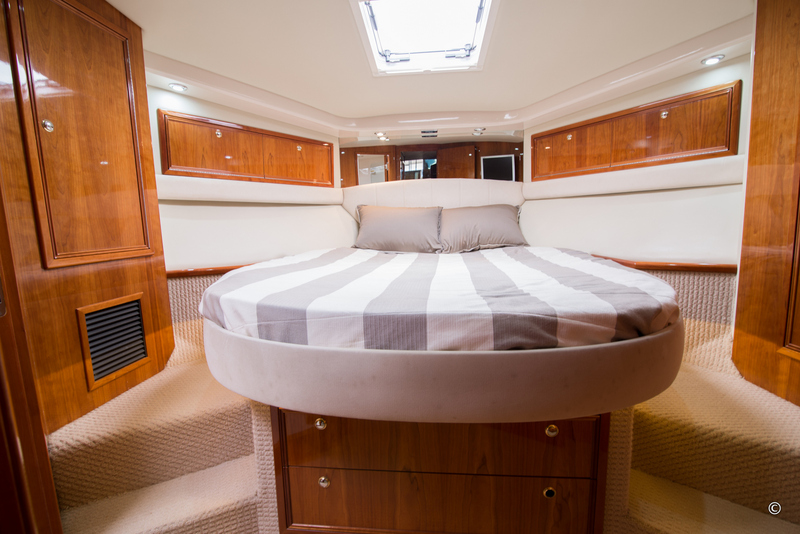 Long rear awning, side quarter glass clears and covers to protect you from sun and wind making the cockpit homely and comfortable. 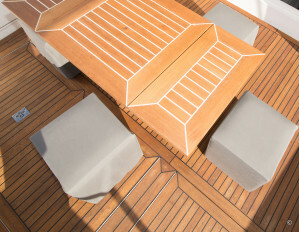 The teak laid swim platform has extra cleats for tying up dingys, a Stainless Steel rail with rod holders and utility board. 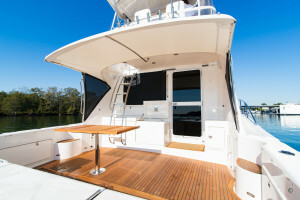 The cockpit has a removable stainless steel electric BBQ. Storage space is huge throughout in this model, cockpit lockers x5, cockpit tackle lockers x 2, cockpit underfloor storage tub, cockpit full-width dual access lazarette area, engine room storage to suit spares and tools, Flybridge double door forward front brow, Flybridge double door under the helm, Flybridge under the lounges, Galley under the floor, Cabins under all beds, Companionway linen cupboard, Saloon overhead rod locker, Saloon draws and all the normal galley draws and pantry storage needed for extended trips. 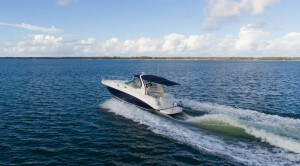 Cruise at 6 knots using 30liters per hour or over 20 at 200LPH giving you a range from 800Nm going slow or closer to 400nm at over 20 knots. 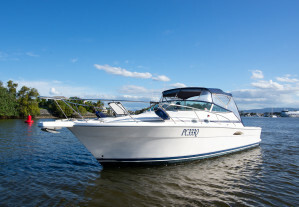 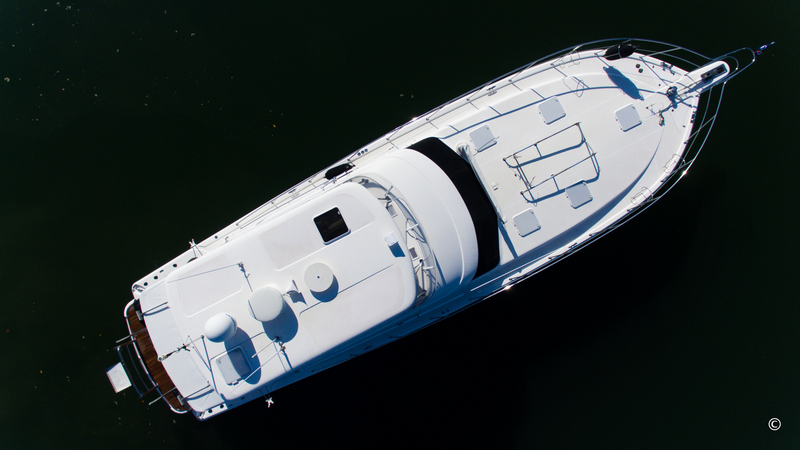 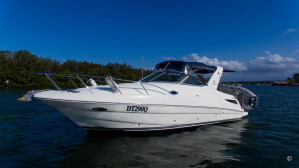 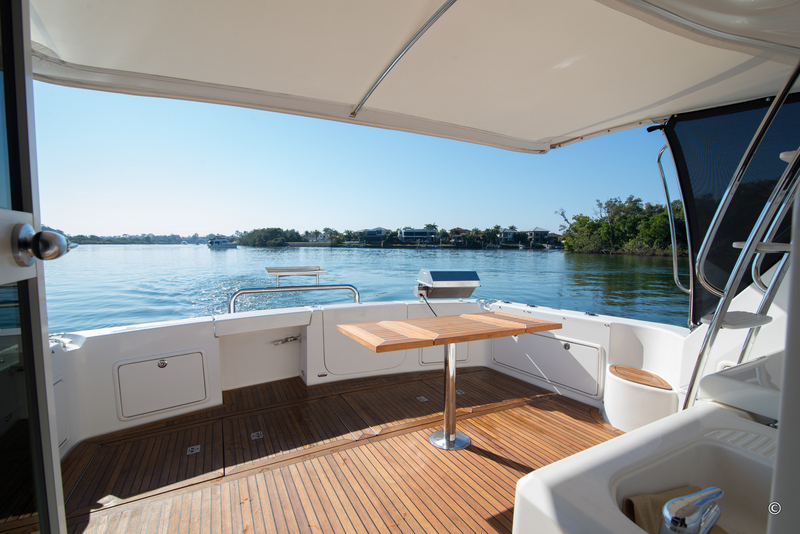 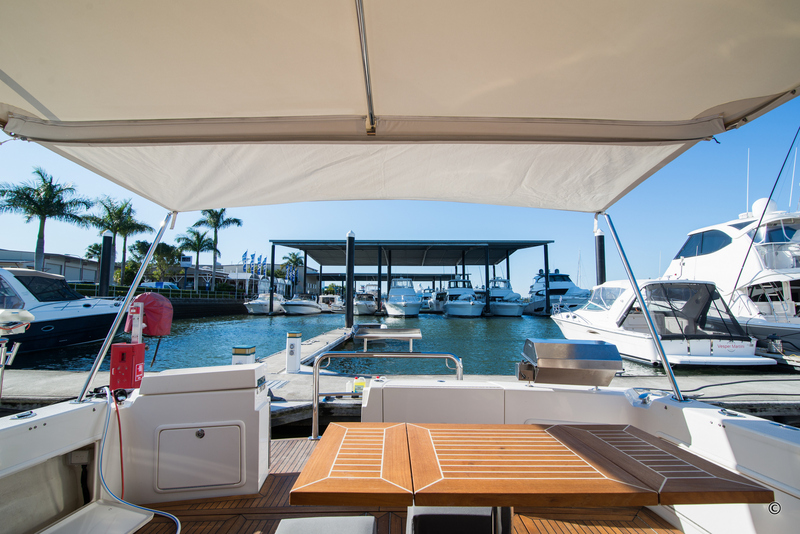 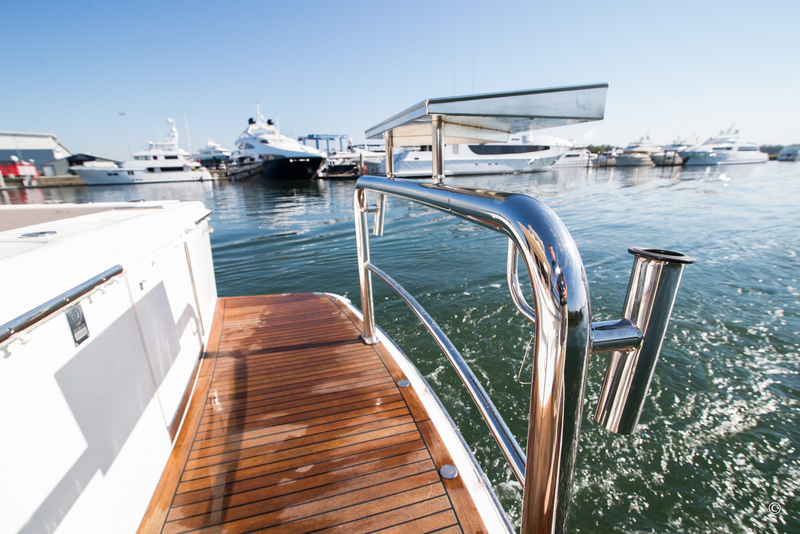 Docking is easy with the aft helm and bow thruster, the boat is equipped with fenders, ropes and includes full tuition provided by trained Riviera staff with years of experience. 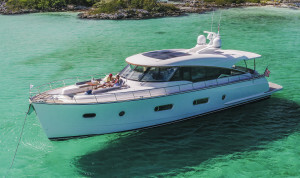 Electronics were fully upgraded in 2015, New mattresses to all cabins, New galley fridge/freezer, rebuilt ice maker, New flybridge freezer, Teak is sanded and in great condition, Gel coat quality is high due to both owners consistent maintenance and general care. Engine room has no rust or corrosion. The flybridge has been set up so there is no rolling of clears. They clip to the roof and the aft sections are cut out so the skipper has the ability to communicate with those helping to tie up. 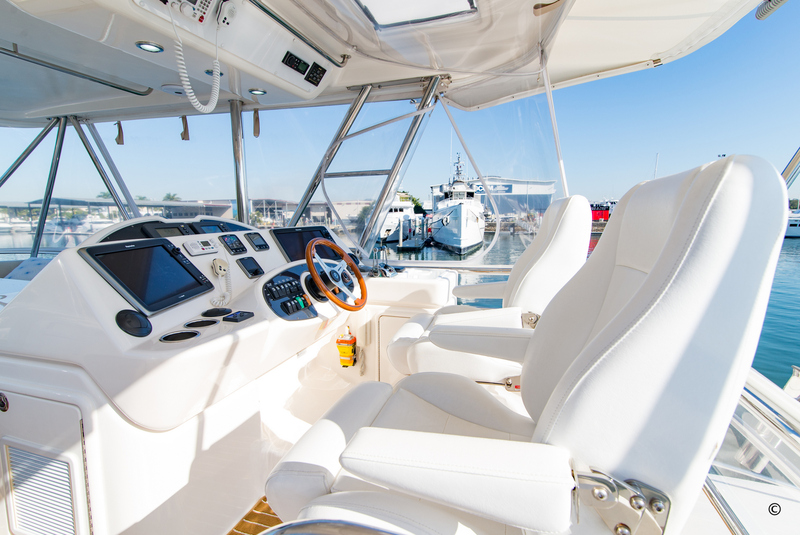 The helm seat are in good quality with fully adjustable stainless posts and footrests. 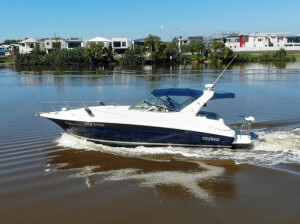 Engine Notes : VERY WELL LOOKED AFTER, VERY RELIABLE, VERY SMOOTH & QUIET WITH UNDERWATER EXHAUST. 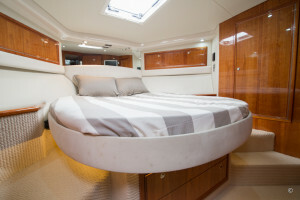 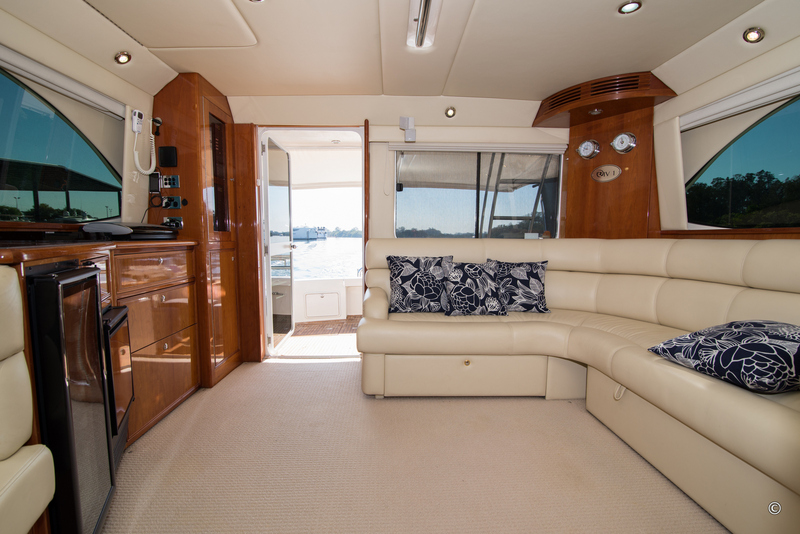 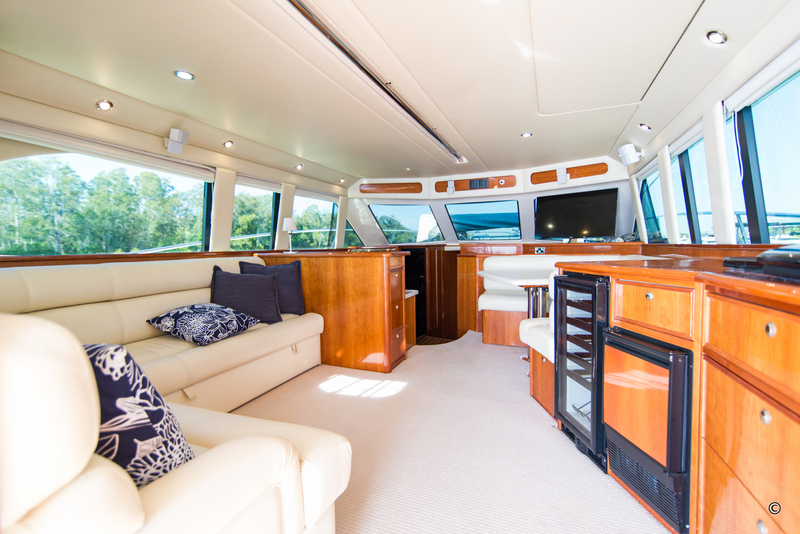 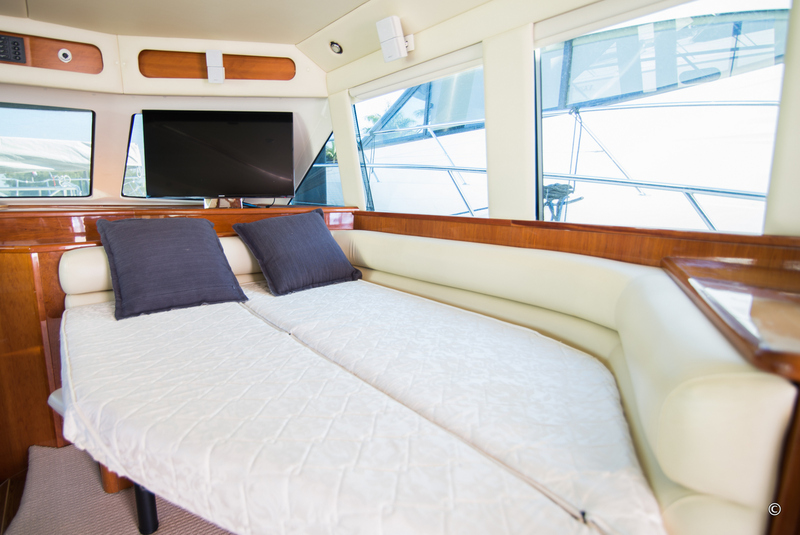 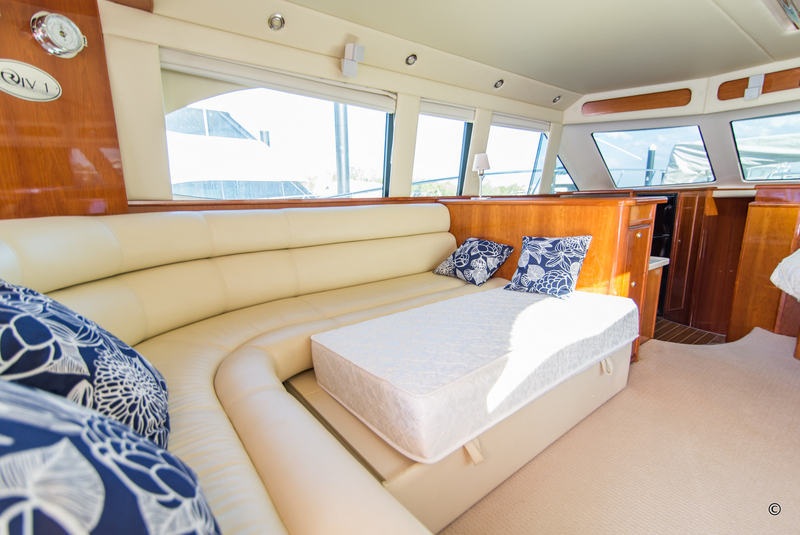 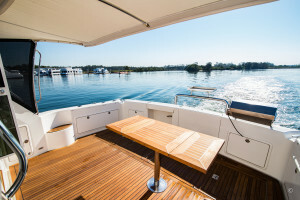 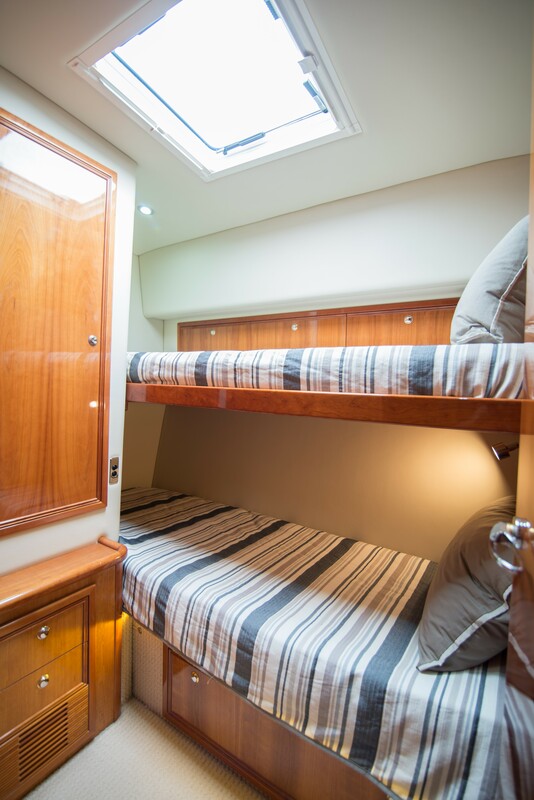 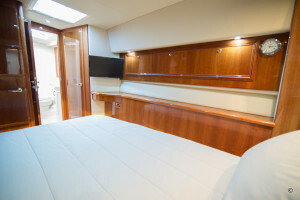 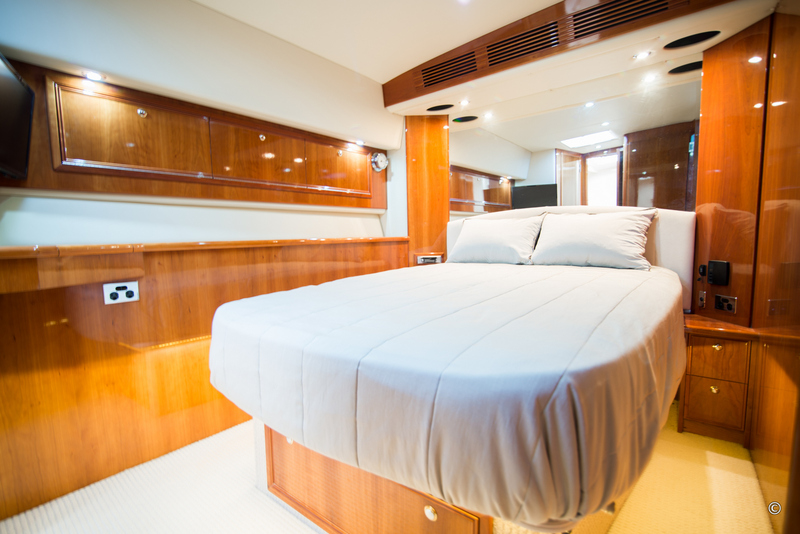 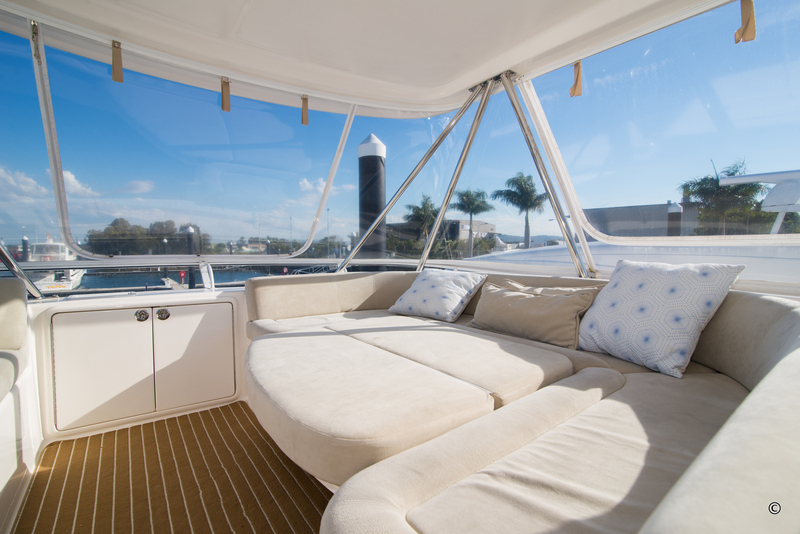 Accomodation Notes : GUEST DOUBLE FORWARD, MASTER STARBOARD WALK AROUND , GUESTS PORT DUAL BUNKS, 1.5 SIZE SLIDE OUT BED UNDER LOUNGE, DINETTE INFILL OVER TABLE TO SUIT ONE OR 2 KIDS, FLYBRIDGE INFILL OVER TABLE TO SUIT 1 SKIPPER OR 2 SMALL KIDS . 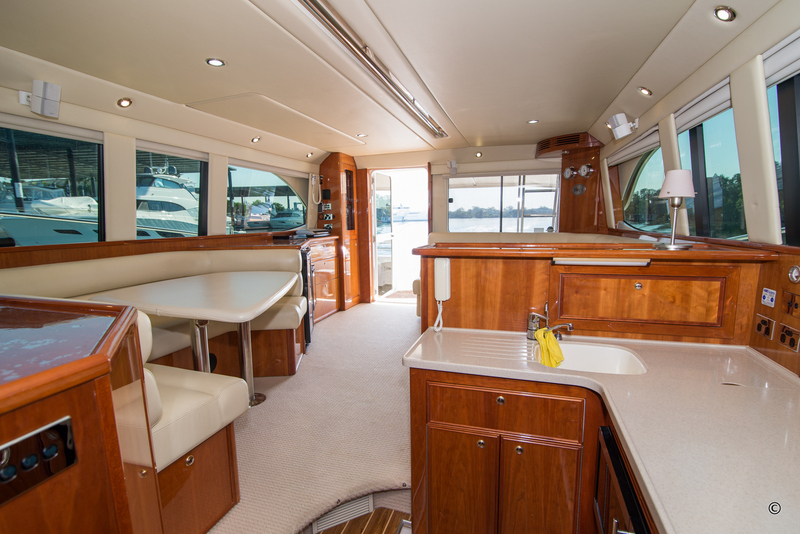 Galley Notes : SMEG CONVECTION OVEN, DISHWASHER DRAW,DUAL BURNER COOKTOP, TRASH BIN WITH LID IN BENCH , INVERTER OUTLETS,HUGE STORAGE IN LOCKERS AND UNDER FLOOR, LARGE BENCH SPACE AND SERVERY, VINYL FLOORING, EXTRA LIGHTING, FILTERED WATER TAP. Refrigeration : 240L FRIDGE/ FREEZER STAND UP COMBO IN GALLEY. 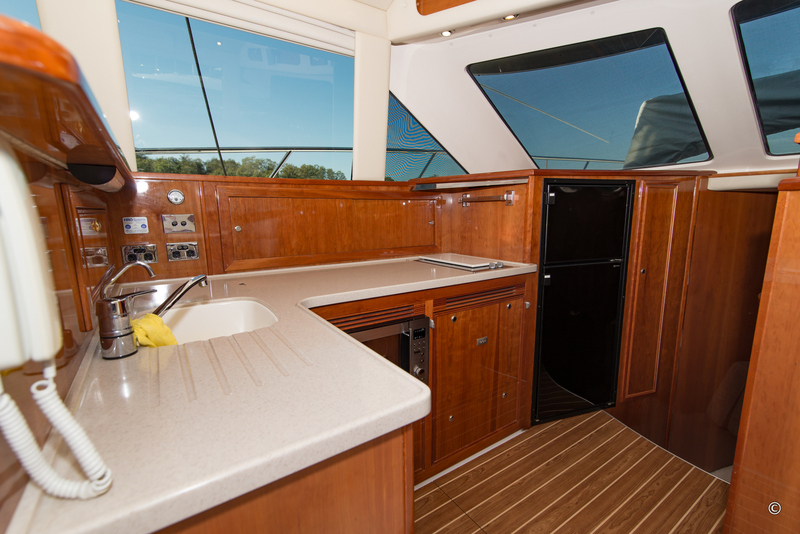 70L FREEZER STAINLESS DRAW IN FLYBRIDGE. LARGE COCKPIT FREEZER , ICE MAKER IN SALOON , WINE COOLER IN SALOON. 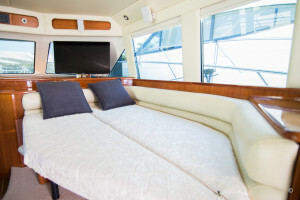 Entertainment and Appliances Notes : ENTERTAINMENTl: BOSE LIFESTYLE UNIT WITH DUAL ZONE FOR INTERIOR AND EXTERIOR, BLUE RAY PLAYER, SAT DOME FOR FOXTEL READY, 42INCH TV ON DASH IN SALOON, CABIN STEREO'S ,FLYBRIDGE STEREO. 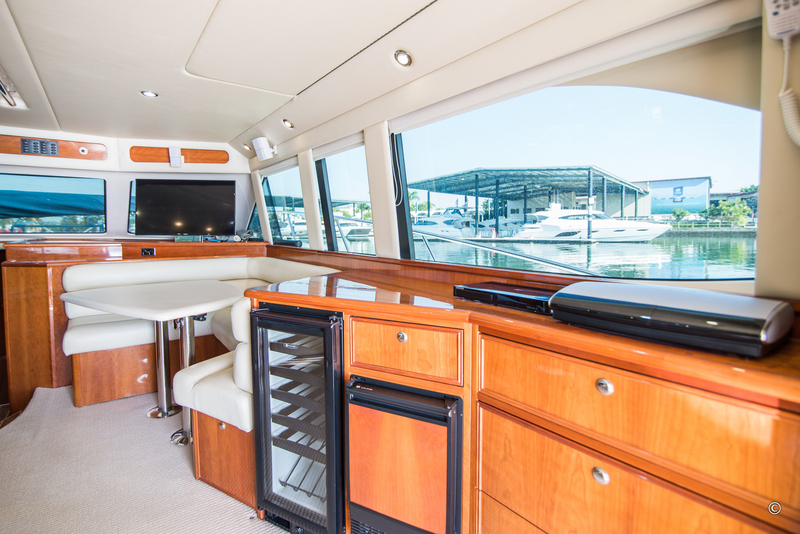 APPLIANCES: WINE COOLER, ICE MAKER, EXTRA INVERTER POWER POINTS, EXTRA USB CHARGE OUTLETS. 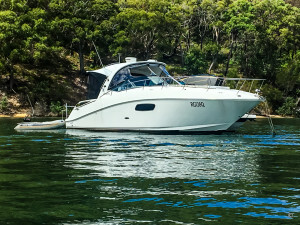 Anchor / Winch : MUIR WINCH WITH 45KG ANCHOR 10MM SHORT LINK CHAIN. 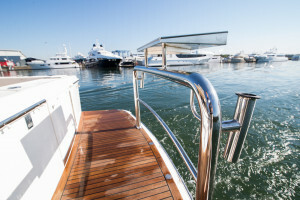 Deck Gear : DAVIT 450KG MUIR STEEL HEAD 1000R WITH CRADLE TO SUIT UP TO 4M TENDER WITH OUTBOARD. 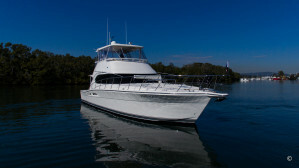 FENDER BASKETS X4 , DECK HATCHES TO ALL CABINS. 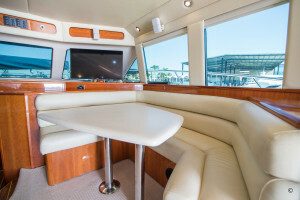 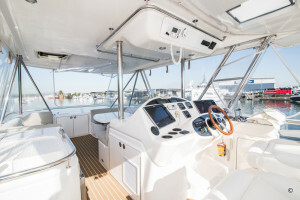 ROD HOLDERS X 6 ON FLYBRIDGE, ROD HOLDERS X 6 IN COCKPIT DECK COMBING. Electrics : LED LIGHTING UPGRADED WHERE POSSIBLE, SPOTLIGHTS LED AFT FLYBRIDGE AND COCKPIT, INTERCOM SYSTEM, VACUUM SYSTEM, CEL FI GO 4G BOOSTER, REMOTE HOLDING TANK SWITCH TO DASH. 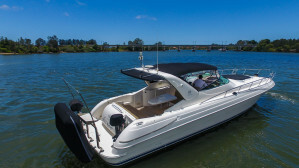 Electronics Navigation : NEW RAYMARINE 2015 2X c165 HYBRID TOUCH, AUTO PILOT, WIND SYSTEM,SEPARATE DEPTH WITH TRANSDUCER. 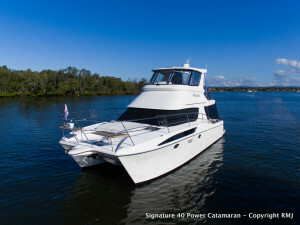 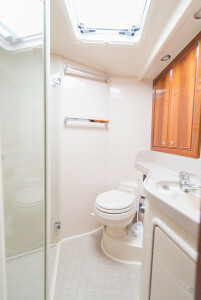 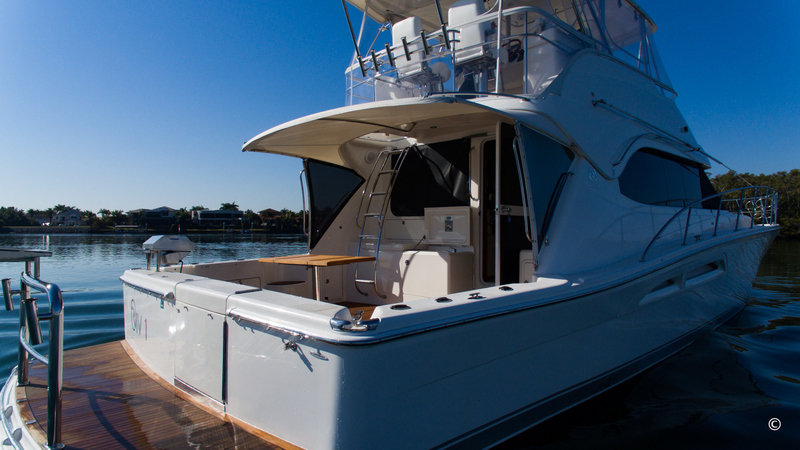 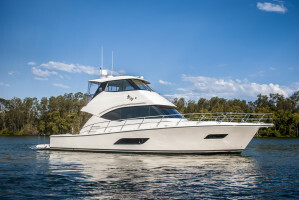 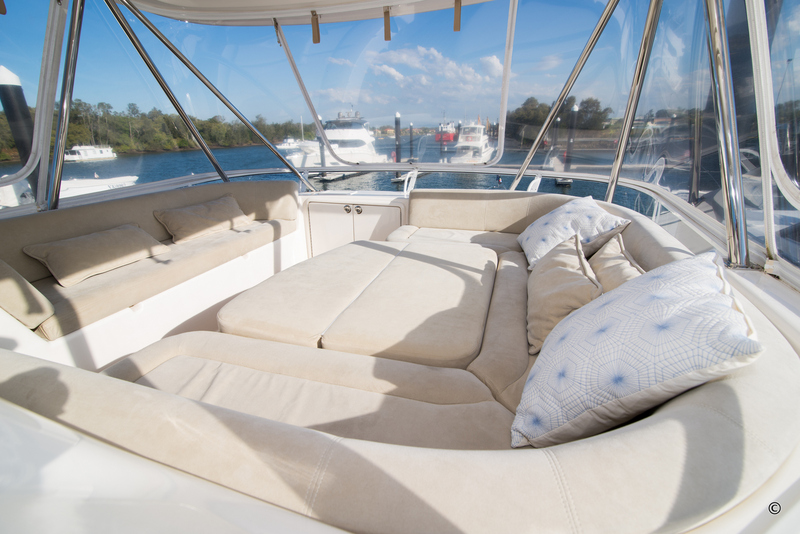 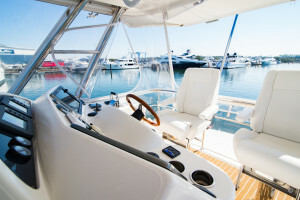 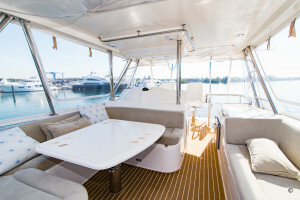 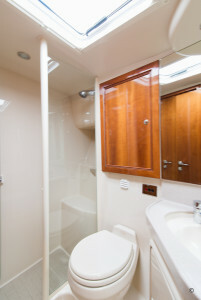 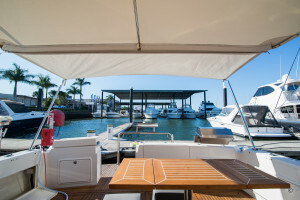 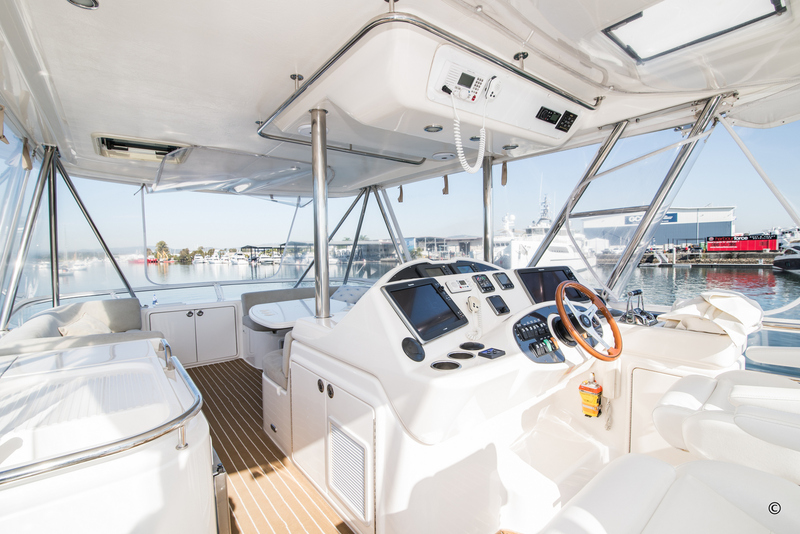 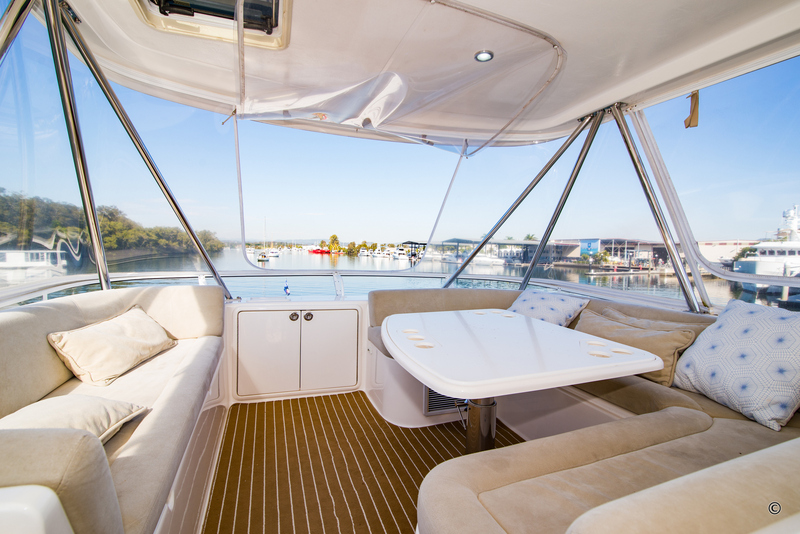 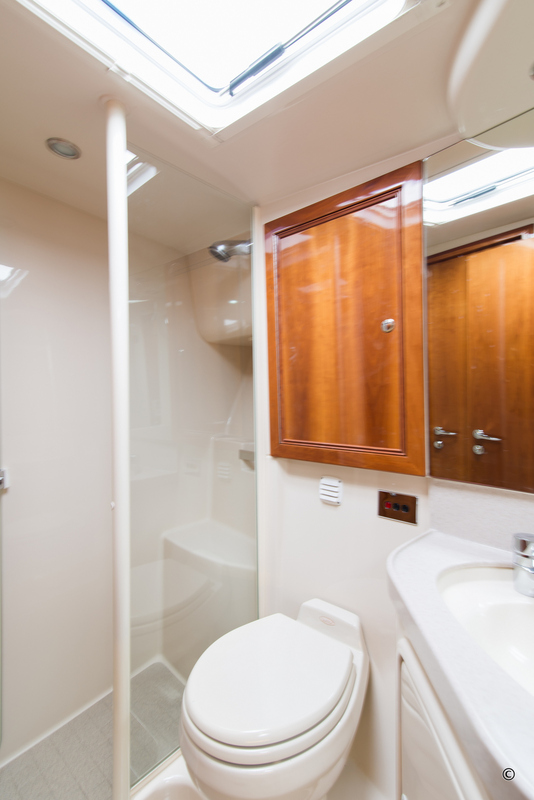 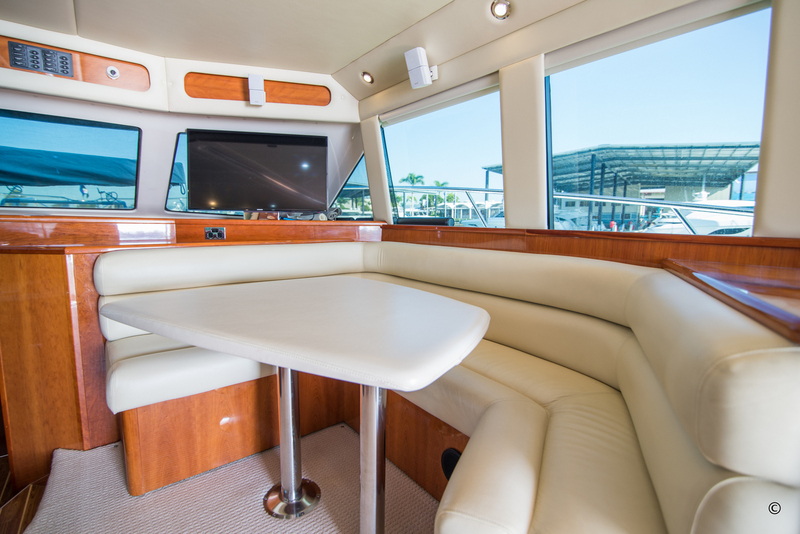 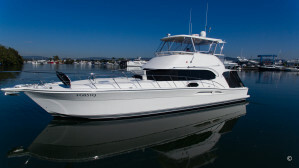 Covers : WINDSCREEN BREEZEWAY, DAVIT , COCKPIT STORM SET, COCKPIT BREEZWAY SET , COCKPIT 1/4 PANEL SET, SWIM PLATFORM , COCKPIT TABLE, REAR AWNING COCKPIT, REAR AWNING TO FLYBRIDGE , EURO AWNING WITH POLES, FLYBRIDGE DASH AND HELM SEATS. 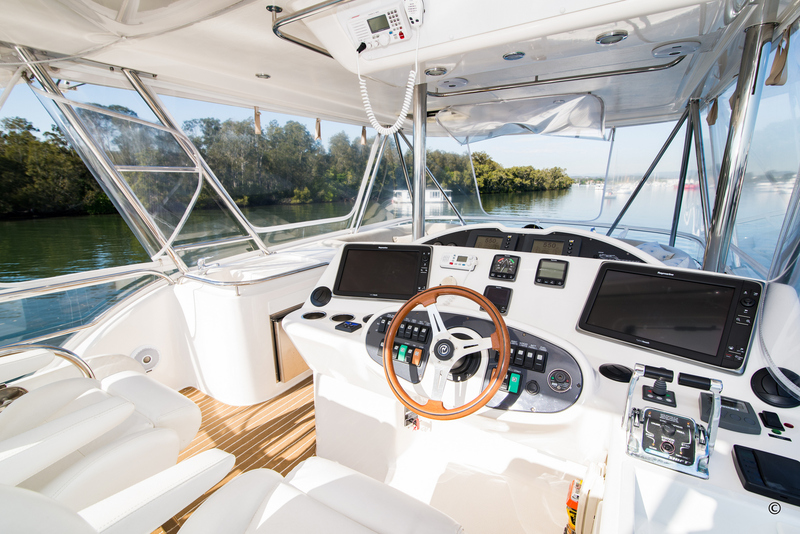 GPS : NEW RAYMARINE 2015 2X c165 HYBRID TOUCH. 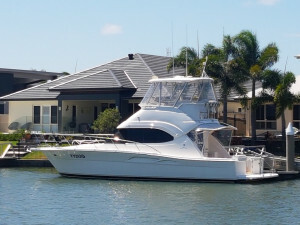 Radio : VHF 1X ICOM M304 1X M602 WITH LARGE ANTENNAS AND REPAETER TO SALOON.